Friday, Saturday, & Sunday will be competitive Mack Days for lottery, prizes, tagged fish and bonuses, as has been the case in the past. Your best 18 days during the Friday–Sunday period count for the lottery, top angler, and other prizes. Anglers receive lottery tickets only for their best 18/26 days Fri-Sun. Anglers fishing more than 18 days will only receive additional tickets if their harvest number exceeds one of their previous 18 days, which it would replace to increase the total. Top ten angler prizes will be determined by the best 18 day average Fri-Sun. All fish count for the bonus tally. The last day (day 51) ends at 3:00 and counts for the bonus but not the lottery. There are separate prizes for the last day. 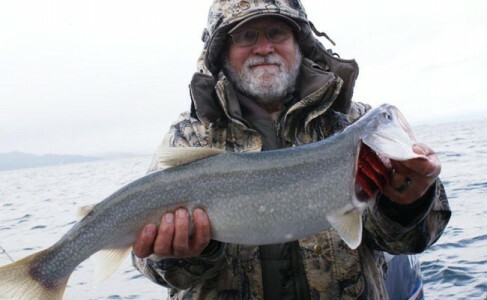 All lake trout submitted for entry are to be caught the same day as submitted. Tuesday, Wednesday, Thursday– turn in your lake trout entries before 6:00–plus(optional) turn in live lake trout to a tagging boat during the day and receive tickets for a special lottery drawing for (2) $500 prizes and there will be 6-$50 ticket drawings, Yeti cooler tickets-1/10 entries, also the tagged fish prizes count- 24 days-Tues-Thursday. Tagging boats will be out as much as possible but not every day-depending on staffing issues and weather. Tues-Thurs totals will be added to your Fri-Sun totals for a final bonus tally at the end of the event. Remember all it takes is one fish to be entered in the lottery drawings that begin at $1,000 and go to $450-(35) cash lottery drawings plus many merchandise prizes. Every lake trout under 30”counts. 1-$10,000, 2-$5,000, & 5-$1,000 Tagged Lake Trout and Over 6,000 $100-$500 tagged lake trout–check the adipose fin on the fish-if it is clipped it could possibly be a tagged fish. Mark your clipped fish with yarn, rubber bands, electrical tie-around the tail or around the gill plate, etc.-make it large enough to be visible to staff counting in your catch-if your tagged fish is not marked staff may miss it. The high dollar tagged fish are tagged each event right before the event begins. Previous high dollar fish are revalued from $100-$500. Tagged fish may be 30-36”. It is legal on the south end of the lake to bring that fish in. North half of the lake it is not legal so those fish may not be turned in for the tagged fish dollars. The large fish category ends at dark or 9:00 whichever comes first–Friday-Sundays only-if you catch a large lake trout over 36” and 24#’s telephone 406-270-3386 to see if someone can possibly meet you at a nearby launch area to weigh and measure the fish-if we are unable to meet you- you will be asked to bring the fish in to Blue Bay-no large fish contest on the last day. A large lake trout over 36” and 24lbs. may be turned in from any area of the lake. Keep a large cooler filled with water-adding to it as needed or use a live well to transport a large fish. Please have a scale on board and know the fish is 24lbs. or over. No lottery tickets are given for any fish over 30 inches. This category ends on Saturday May 12th. Weekend Drawings-5-$100 drawings-will be held each week with witnesses present and names announced and put on the board-no limits. Tickets can then be put into the drawing tumbler to save time on the last day. There may also be a few merchandise drawings-anglers do not need to be present for these drawings. Again there will be a Heaviest Bucket of Fish competition included for 3 days of the event. Friday-3/30, Saturday-4/21, & Sunday-5/6-prizes will be given for the 4 heaviest fish under 30 inches. The four fish entries are to be tagged or identified with some kind of marking-electrical ties, string, rubber bands- before coming through the door at Blue Bay. Fish will be put in a bucket and one weight per boat or shore angler team. No changes will be made to entries-this has to be the rule because of time limits-points given based on weight. Top weight for each of the three days will win $200. Overall prizes based on total points-a tie broken by weight- at the end of the three days $300, $200, & $100 will be awarded at the end of the event. SPIRIT OF THE RULE: It is the intention of this event to promote good sportsmanship and fair play. Anglers are asked to follow high standards of sportsmanship, courtesy, and conduct themselves in a manner that will be a credit to them, the sport of fishing and help sustain a successful Mack Days contest well into the future. Unsportsmanlike conduct, stealing, and cheating may result in disqualification. No pooling of fish is allowed, meaning all participants must report only the fish they catch themselves. Specifically for the “Top Anglers” “Top Ladies” “Youth” “Over 70”- the intent is that the contest be an individual competition rather than a team competition. We cannot police these highly competitive categories adequately and must rely on all anglers to respect the principle of fair competition. The rewards in these categories are intended to be more personal than monetary and therefore depend on the integrity of the competitors. Anglers may receive assistance from other anglers in the boat but need to respect the competitive nature of the contest, by clearly identifying their rods from those of other anglers present in the boat and being the only angler handling those rods. All anglers in a boat, entered in the contest, must have at least one fishing rod in the water and be responsible for the fish caught on that rod. Assistance does not include having a driver for a trolling boat unless anglers are rotating the driving and fishing and/or separating their fish or dividing them equally. Keep separate coolers if necessary. 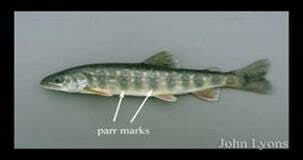 If your numbers do not show that fish are being separated-the numbers will be separated when checked in by officials. Having someone in a boat that is not fishing but is assisting and not turning in fish will be cause for disqualification from the Top Angler, Ladies, Over 70, or Youth Categories. This is a competition and everyone entered in the competition must follow the same rules. We ask that anglers be responsible boat captains-always operate your boat in a safe manner and use good judgement. Especially when in launching/camping areas be careful and respectful of other boaters and shore anglers or recreationalists. Keep a safe distance away from other boats/anglers, watch for anchor and casting lines, and respect the space and needs of anglers for fishing. If an angler is casting out from their boat give them room to safely cast the lines-at least double the cast–ask if you are too close. Don’t sit your boat down right where they are casting their lures to-even if you are not going to cast. You will be too close. You will need room and so will they. Trolling boats, casting boats, and jigging boats need to be observant of each other. – Please be aware of and attempt to avoid anchoring in trolling paths-don’t move in on a trolling path a boat may be repeatedly using-they may be trolling a path and going over a spot that is working for them several times-watch for markers that may be out. Trollers need to realize that if they are trolling a large path others may not realize they have sat down in their path-use markers if possible. Use common sense and courtesy about this issue. Likewise if a boat is anchored be courteous and avoid trolling nearby or approaching too closely-anchor and casting lines are easy to snag. If several boats are anchored up don’t go trolling through the area. Lines will be everywhere and it is easy to catch them. It is a large lake and lots of area for everyone. Please wait your turn-if there is a line at the boat ramp you need to wait and take your turn just like everyone else. Have your boat ready before getting to the ramp area. Take off the cover, load items you need, do all of your safety checks before getting to or backing down the ramp. After unloading your boat from the trailer move it to the other side of the dock so others can unload-then park your vehicle. Don’t sit on the ramp area after pulling out of the water. There is room for two boats at a time at Blue Bay if you keep to one side or the other-use both sides of the ramp. Be courteous, and helpful if needed. Be willing to help out when others need advice or assistance. Winds on Flathead Lake can make loading impossible at times: don’t panic-if you come in and can’t get loaded especially if you are alone-pull into a marina area to wait out the storm-get behind an island or in a calmer bay area. If you need our help don’t hesitate to ask-if you have an emergency out on the water-call 911 first, then call. 406-270-3386. There is a fee for use of the Blue Bay boat ramp and parking area and campground. Telephone 406-883-2888 or 406-253-3813 for information about boat ramp and camping fees. Interpretation of the rules shall be left exclusively to the event officials/committee; all decisions are final. Only event officials or anglers entered in the event have the right to protest the actions of another angler. Protests by anglers must be filed in writing no later than 24 hours after the close of that fishing day. The event officials will convene/conference to investigate and make a decision. The decision will be a majority vote of the officials and will be final. Contestants waive any right or opportunity to appeal the decision of the officials to a higher authority, including any court of jurisdiction in this or any other state. Any person found violating the rules, stealing, or cheating in any form may be immediately disqualified and the reasons for disqualification announced at the event headquarters. Event officials reserve the right to change or modify these rules at any time. ICE, ICE, ICE,-all fish entries are required to be kept on ice. Ice should be layered in coolers. Please keep your coolers clean. Fish should be at 41 degrees internally when entered. We will be checking the temperatures of the fish. Each angler has the option of donating their fish to be processed or keeping their fish-warm fish will not be accepted for donation. Live well water pumped in from the surface of the lake is not cool enough to keep the fish at 41 degrees. Ice needs to be added to the water or the fish need to be kept in a cooler with ice. Freeze several bottles of water to use in your cooler if you cannot purchase ice for the cooler. Layer the ice and the fish. Ice doesn’t do much good if it is all on the bottom of the cooler. Cold travels down. Your best defense is always WASH, CLEAN, AND DRY when moving your boat and trailer to any area INCLUDING all equipment, lines, anchors, live wells, etc. Be sure and do an inspection yourself before launching into any water body. Mussels-when small- feel like fine sandpaper on the bottom of the boat or on equipment such as anchors and anchor lines. If you move your boat between water bodies suggested time frames after cleaning, draining, and then the drying (all water drained) if you suspect your boat may have been in contaminated waters or just to be on the safe side-is to dry: 7 days in the summer months June-August, 18 days in the spring March-May or in the fall months September-November, 30 days drying time in the winter December-February or freezing for 3 days.Thorough cleaning of any plants or animals prior to launching your boat will help to prevent the spread of aquatic nuisance species. Report any sightings of an aquatic nuisance species to the National Hotline: 1-877-786-7267. Wash, clean, and dry-our best defense against these invaders. CAMPGROUND and BOAT RAMP-be aware that fees have increased. Check out the rates on the website @www.mackdays.com. We will be able to have yearly passes for sale if the attendant at the gate is not there. The yearly day use pass is $60. Daily passes will be $10 per day. Bull trout in Flathead Lake are a threatened species westslope cutthroat trout are a species of special concern listed under the Endangered Species Act. Lake trout are the only fish accepted for entry in Mack Days Fishing Events. We ask that everyone check out bull trout and westslope cutthroat trout identification before participating in the event. Go to the www.mackdays.com website or Montana Fish, Wildlife, and Parks website to check out bull trout AND lake trout ID. Ask for information-we would be glad to provide you with ID brochures. By-catch of the smaller bull trout is higher in the Spring Events than the Fall Events.They are very difficult to distinguish from the smaller lake trout. The spots on the side of the bull trout can be very pale and not show much color-red, orange. Look at the tail and spread it out. Bull trout will not have as deep a V in the tail but some will fool you with a slight V. You then need to look at the spotting along the back from the topline of the fish. 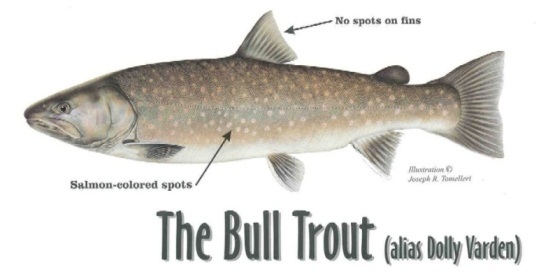 Spots that are rounded and evenly placed indicate a bull trout. The larger bull trout coloring can also be very pale. Again, look at the tail and the spots on the topline of the fish. You have to look at each fish carefully. IF YOU HAVE ANY DOUBT ABOUT THE ID OF THE FISH PUT IT BACK. DO NOT TAKE A CHANCE TURNING IN A BULL TROUT. We are required to report bull trout violations to the enforcement authorities. Many contestants have received fines and if the number of bull trout killed becomes too large it may jeopardize the future of the contests. For your protection use a separate cooler to keep track of your lake trout entries if you are fishing with another angler. The CSKT Fisheries Program’s goal for Mack Days contests is to help slowly reduce the smaller sized lake trout in the population. The Flathead Lake and River Fisheries Co-Management Plan’s goal is not to completely eliminate the lake trout population, but to find a better balance between a recreational fishery based largely on lake trout and healthier native trout populations. If you have any questions please contact us. All anglers must have state or tribal fishing licenses; based on which part of the lake they choose to fish. Mack Days Fishing Events include all of Flathead Lake. A special $13 tribal license is available to any resident or non-resident for fishing the south half of Flathead Lake only. Anglers must observe U.S. Coast Guard, Tribal, and Montana FWP regulations. By entering/signing/sending/faxing/e-mailing entry, all participants agree to the following release of liability to forever discharge the event, CSK Tribes, Mt. FW& Parks, Event Committee, & Officials of every claim, demand, action, or right of action, of whatever kind or nature, either in law or in equity, arising from or by any bodily injury or personal injuries, known or unknown, death or property damage resulting or to result from any accident which may occur as a result of participation in the event, whether by negligence or otherwise by ourselves, our heirs, executors, or assignees. This release contains the entire agreement between the parties hereto, and the terms of this release are contractual and not a mere recital. I also understand that photographs may be taken of me and used for promotional purposes without royalties. Your submission of the entry form signifies you have read and agree to the above statement. We remind anglers to think safety first and always be weather wise while fishing on Flathead Lake. Check the Mack Days website for weather and wind conditions-www.mackdays.com.